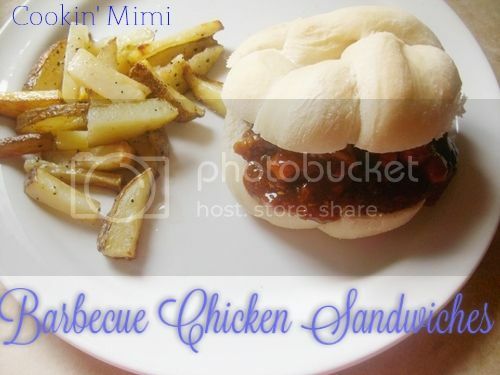 Barbecue Chicken Sandwiches that can be made in a skillet or slow cooker. I adore the combination of chicken and barbecue sauce. Some variation of that combination is what I make when I’m feeling uninspired come supper time. This particular recipe is a tweak of my sloppy Joe recipe and came about when I had planned on making sloppy Joes only to discover the ground beef I thought was in the freezer had been used. I did, however, have some chicken breasts in the freezer. So I swapped the ketchup called for in the original recipe for barbecue sauce and a new family favorite was born. Heat oil in a skillet over medium heat. Cut chicken into cubes and add chicken along with the onions to the skillet. Season with salt, pepper, and garlic powder. Cook until chicken and onions are browned. Add the rest of the ingredients, cover skillet, and simmer over low heat for 30-45 or transfer to a 4 quart slow cooker and cook on low for 4 hours or high for 2 hours. Serve on buns or sandwich rolls. Glad you were out of ground beef, because this sounds delish!!!! Will be going on my menu list, for sure. Thanks for another delicious recipe, also easy to make!!!! !